Fit for Life is a collaboration between The Mercury and the Pottstown Health and Wellness Foundation. Follow Pottstown Mercury's board Fit for Life on Pinterest. 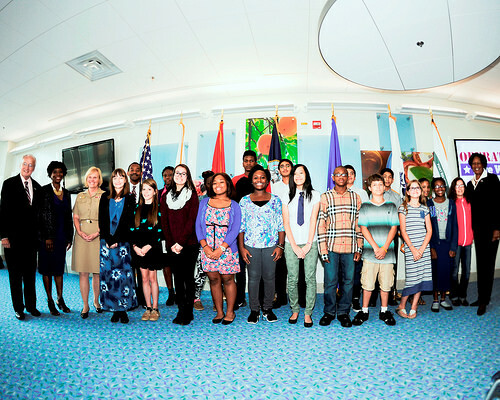 Concannon (far left) with students from Walt Whitman Middle School at Fort Belvoir Community Hospital, Va., Sept. 18, 2014. Tackling the child obesity epidemic that holds so many health risks for our nation’s youngest members is an important responsibility. Fortunately, USDA is not alone in this critical charge. Sound nutrition plays an essential role in all aspects of a child’s life, including their ability to learn, grow and thrive in the classroom. And since many children today consume half of their daily calories while at school, we want to ensure the healthy choice is the easy choice for them and their families. Happily, we have partners that feel the same way. That message was underscored by USDA Food, Nutrition and Consumer Services Under Secretary Kevin Concannon during a recent Operation Live Well event at Fort Belvoir Community Hospital. Operation Live Well is a Department of Defense wellness campaign that aims to make healthy living the norm for service members, retirees, DoD civilians and their families. The Under Secretary was joined by Assistant Secretary of Defense for Health Affairs, Dr. Jonathan Woodson, and retired Brig. Gen. Julia J. Cleckley from Mission: Readiness, a nonpartisan national security organization, comprised of more than 450 retired admirals and generals who help make smart investments for America’s children. The three leaders emphasized the need to promote a healthier next generation. On this day, the speakers stressed the necessity of eating healthy and staying active. The event included students and teachers from nearby Walt Whitman Middle School in Alexandria, Virginia, and various military members from all branches of the U.S. Armed Forces. The guests got a chance to tour the hospital’s cafeteria and observe how the Army identifies healthy food choices through their nutrition education program, Go For Green. There, food items are color-coded green (eat often), yellow (eat occasionally), and red (eat rarely) based on the impact the food has on a soldier’s performance. Cleckley pointed out that the obesity problem in America is also a matter of national security. According to a recent Mission: Readiness’ report, “Retreat is Not an Option” one in four young adults are too overweight to serve in the military. I was alarmed to hear how many young men and women are unfit to serve in the military due to obesity. Being a New Jersey National Guard Airman, I take great pride in serving my state and nation and understand that a nutritious diet is vital to staying fit. The message to continue improving the quality of meals served to students in public and private schools that participate in the National School Lunch Programshould hit home with anyone concerned with our children’s health. Mission: Readiness reminds us that we can lead, follow or retreat when it comes to combating obesity. When it comes to the health of our children, retreat is simply not an option. Connection matters. Belonging matters. Your story matters. Adverse Childhood Experiences (ACEs) matter. Click image to find out more.